What’s in a sign? How new signage helps. Traffic safety and directional signs are a vital component of regulating the highways, streets, and parking lots of our community. Without them, traffic and commerce would come to a standstill. 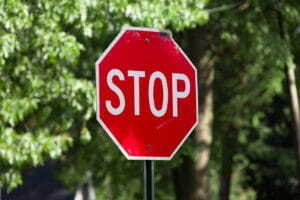 Road signs also play a critical role in traffic and pedestrian safety. The raising of speed limits has been studied extensively over the years and many cities have found that increasing speed limits has had a net positive effect on lowering traffic accidents. We’re going to look at three reasons why getting your traffic signs manufactured by Stripe Rite is not only the smart thing to do but can help save time, money, and prevent costly compliance issues. The Pacific Northwest is known for its wet weather, cold winters, and windy days. Road signs bear the full brunt of Mother Nature. As the months and years go by, even the strongest of signs can start to weather and show signs of rust and damage. New traffic and road safety signs are not only much more visible to motorists and pedestrians, but they’re also engineered out of stronger and more durable materials than those crafted 20 or 30 years ago. The new, more durable signage material ensures that each sign will last for a very long time and stand up to anything Mother Nature can throw at it. Stripe Rite only uses high-quality material for all of our signs. This ensures that they are not only highly visible but will stand up to the elements year after year. Depending on the application, regulations, and where it’s to be installed, signs can be made out of one of several different materials. If you’re not sure which material is right for your application, give our friendly sign department experts a call. They’ll be able to help guide you through the design and material selection process. Stripe Rite has been in business for well over 30 years and the knowledge and experience we’ve gained has ensured that our signs meet the strict Federal MUTCD standards and State DOT requirements. We’re able to keep our costs to a bare minimum while at the same time ensuring that the right specifications are met. We’re also listed on the Washington Qualified Products List (QPL), which gives us the ability to create and install signs for every job – from the open highway to schools and parking lots. If your department or organization requires traffic, safety, or road signs that comply with various laws, give us a call at (509) 535-4965 to speak to one of our sign experts. At Stripe Rite, we’re experts on signage and traffic safety and can help design, manufacture, and install traffic and parking lot safety signs that will last for a long time.